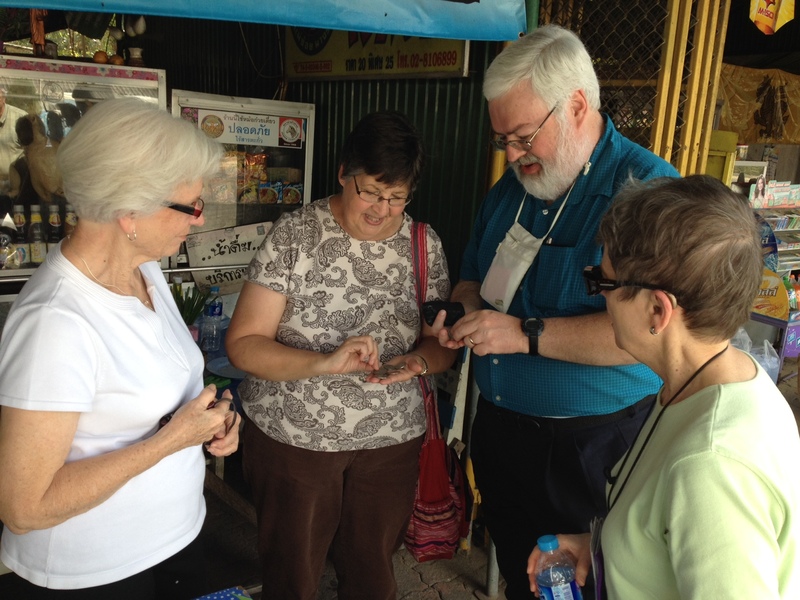 We were greeted by Marcia and Duane Binkley and Kyle Witmer in Chiang Mai, Thailand. The Binkley’s have made this their home for many years. We were happy to be done with flying for awhile. We stored our gear in a van and pick up truck and headed south to Hot for lunch, about an hour and a half south of Chiang Mai. Driving here is like being in a Nascar race only with the cars coming and going in all directions including coming right at you. Motorcycles buzz around you all the time like mosquitoes. Even though it is the dry season and has been dry for some time much of the scenery passing by is green and lush. There are fruit trees, rice paddies, all kinds of flowering plants including wild poinsettias in many places. Pick up trucks are as plentiful as minivans in a suburban shopping mall. Click on image below to view full size.